I love a good cocktail party, of course, for the cocktails themselves but maybe even more for the little servings of food that go so well with a drink. Cocktail party food is always fun food, and that certainly applies to the offerings you’ll find in Mary Guiliani’s new book The Cocktail Party . I received a review copy. She shares stories from her years of catering along with ideas for parties for every season of the year and every time of day. I caught the episode of Barefoot Contessa when she showed Ina how to make her mini grilled cheese sandwiches which is one of her signature party menu items. After cooking, the sandwiches are cut into cute, bite-size, tiny triangles. There are several versions found throughout the book for different themes. The Mini Buffalo Chicken Grilled Cheese and the Mini Sausage and Egg Grilled Cheese were two of my favorite ideas. Another one of her popular menu items is pigs in a blanket, and there are multiple versions of it as well. I need to find a good chicken or seafood version of a mini sausage to try wrapped in puff pastry. The book is organized by party theme, and there are menus and planning ideas for each of them. In addition to a basic party menu, there are also suggested “Snacktivities” for each party, and these are actually buffet options for guests to build their own snacks. I loved the idea of a Mozzarella Bar with fresh ricotta, burrata, and mozzarella along with breads, and toppings like eggplant caponata, roasted peppers, roasted tomatoes, and olive tapenade. Some other party dishes and tips that caught my eye were Mini Banana Pancakes with chocolate chips for a breakfast party; the bottles of tequila hanging on strings from a tree branch for a tasting event; the deviled egg bar with various spices and toppings for sprinkling on top; and the big bowl of Buddha Punch made with wine, champagne, orange juice, lemon juice, rum, and club soda. In some cases, the photos are styled a little differently than the recipes or ideas are described in the text, but that leads you to more ideas for making your party your own. Also, there are suggestions for which items can be purchased rather than made from scratch to let you decide how much time to spend on each part of an event. 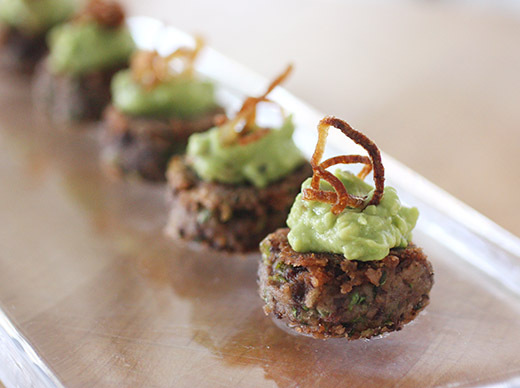 The first dish I tried was the mini Black Bean Cakes from the Cinco de Mayo party theme. These are little, crispy, vegetarian cakes that can be formed in advanced and cooked just before serving. Optionally, they could be cooked in advance as well and reheated in the oven before serving. The cakes are made by pureeing rinsed and drained black beans in a food processor with salsa, cumin, and coriander. That mixture was transferred to a mixing bowl, and panko breadcrumbs, finely chopped green onions, cilantro, and salt were added. You should consider the texture at this point. The salsa I used was a bit runny, so I added some extra breadcrumbs to bring the mixture together better. Next, a baking sheet was lined with parchment, and little cakes were formed by using a mini ice cream scoop. I flattened out the cakes by hand. 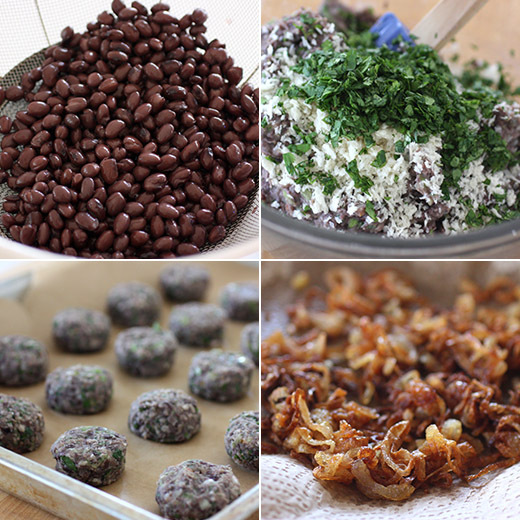 The sheet of black bean cakes should be refrigerated for about 30 minutes before cooking to firm them up a bit. They were cooked in olive oil in a big skillet for a few minutes per side. I made some guacamole for topping, and I opted to fry shallot rings rather than garnish with store-bought fried onions. At this size, each bean cake worked perfectly as one bite which is just what you want when you have a cocktail in one hand. In the head note in the book, it’s pointed out that these bean cakes would also be great as vegan sliders on mini buns. With all the great ideas I’ve just learned here, I need to get to work on a guest list and pick some dates for parties. 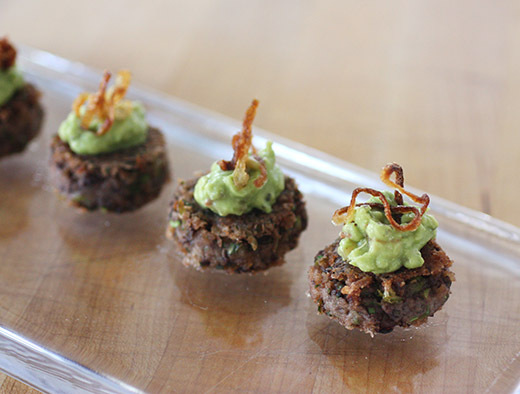 These are some fantastic finger food! i always said that i could be a vegetarian simply because black beans exist--i love those things! i would actually prefer these patties over any made from meat! How cute are those? And delicious. What a super idea for party or football food! Anything that can be made ahead to save time is a big plus. Hope you're going to make more for us from that gem of book! What a great make ahead recipe! Perfect for any kind of festive get-together. This book is new to me and worth exploring. I am missing your desserts. I'm trying to completely avoid sugar for Lent! But, I just read a new cookie book and am making plans for baking in a few weeks. Hi Lisa, I know I would love these appetizers, they look fabulous, wonder how they would work in a "patty" form on a bun or a bed on lettuce? will be indulging into it this weekend, for sure! Lisa these look perfect and delicious and love the guacamole on the top, just perfect !! We often invite friends over for a cocktail before we all go out for dinner. These little bites would be a nice item to serve…thanks. I better add this book to my "wish list" I haven't bought a cocktail party book in waaay to long!